Why Do These Super Light Wheels Looks So Awesome On The M5? 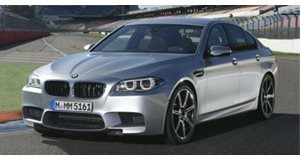 Without any modifications to its style or performance the BMW M5 is an absolute beast of a sports sedan. Straight from the factory the high performance German four-door is powered by a 560-hp twin-turbo V-8 capable of pushing the car to 60 mph in a mere 3.7 seconds. For those looking to enhance the look and capability of the car without getting overly technical, American tuner Vorsteiner has just debuted a brand new set of awesome 21-inch V-FF 103 Flow Forged wheels specially designed for the BMW M5. The wheels are constructed using a flow forging mechanism that results in an ultra-light weight and highly durable finished product. The BMW M5 in these photographs is fitted with a full set of the gorgeous new 21 inch wheels from Vorsteiner in a gunmetal gray finish. We love the way that the car looks slammed on these rims and also how the bright red brembo brake calipers beautifully contrast the color of the wheels. What do you think?